The Ashton, Fort Worth's only small luxury hotel is ideally located in the vibrant center of downtown just steps away from Bass Hall, clubs, restaurants and theaters. The upper floors of the hotel house twenty-nine elegant guest rooms and ten suites, each luxuriously appointed with custom designed furniture. Select rooms feature a romantic clawed-foot jacuzzi tub, twelve-foot ceilings, and magnificent views of historic Main Street. The guest room baths boast pedestal sinks, platform tubs, high ceilings, data port telephones and elegant Gilchrest and Soames amenities. With a total square feet of 4,863, the Ashton can accomodate 10 people in our custom-furnished Boardroom up to 150 people banquet style in our Winfree Ballroom. There are also 2 other meeting areas as well as our intimate Wine Cellar for small dinners or parties. Slate floors, natural stone and wood create an elegant setting highlighted with the warmth of gold pressed-tin ceilings and dimmed lighting. Pets are allowed with a refundable deposit. Only 20 miles to D/FW International Airport. Shuttle is available at $15.00 per person one way and Taxi is $55.00 per person one way plus $2.00 each additional person. 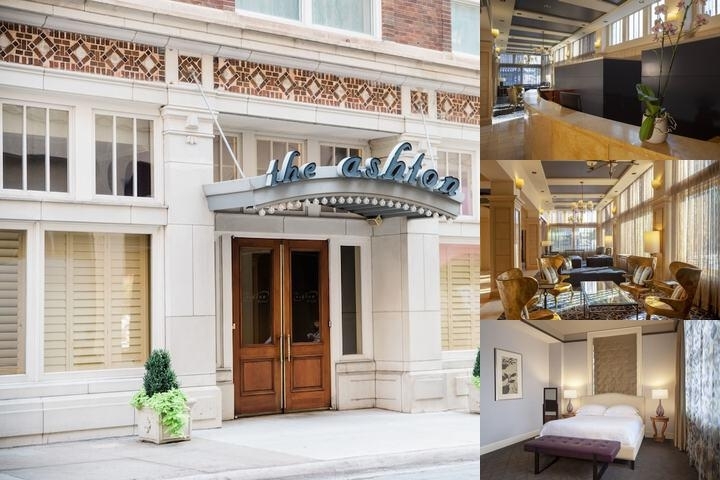 Below are the meeting, banquet, conference and event spaces at The Ashton Hotel. 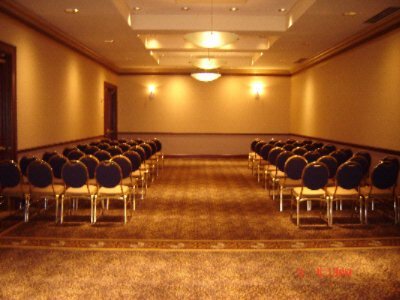 Feel free to use the The Ashton Hotel meeting space capacities chart below to help in your event planning. Hotel Planner specializes in Fort Worth event planning for sleeping rooms and meeting space for corporate events, weddings, parties, conventions, negotiated rates and trade shows. With a private entrance on Main Street, The Winfree Ballroom is the ultimate setting for any type of function from weddings to corporate meetings. The ballroom's interior consists of custom designed carpet and draperies and a ceiling featuring gold pressed-tin tiles accentuated with nine alabaster chandeliers. 43 x 56 x 12 Ft. 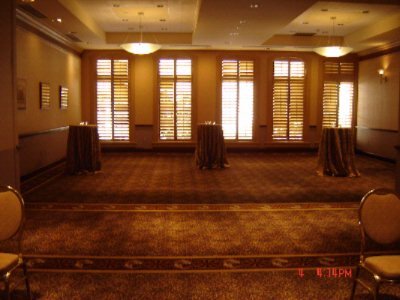 The Winfield Room is located on the second floor and opens onto a pre-function space with its own coat closet and beautiful marble bar. Access to The Winfield Room is by private elevator to the second level. The Winfield and Scott Rooms can be combined for larger functions. 40 x 20 x 10 Ft. The Scott Room is located on the second floor which opens onto a pre-function space with its own coat closet and beautiful marble bar. The Scott Room has arched windows overlooking historic Main Street allowing for natural light. Access to the Scott Room is by private elevator to the second level. The Winfield and Scott Rooms can be combined for larger functions. 28 x 29 x 10 Ft. The Boardroom is on the second floor and opens onto a pre-function space with its own coat closet and marble bar. The Boardroom has arched windows overlooking historic Main Street, allowing for natural light. Access to the Boardroom is by private elevator to the second level. 26 x 13 x 10 Ft. 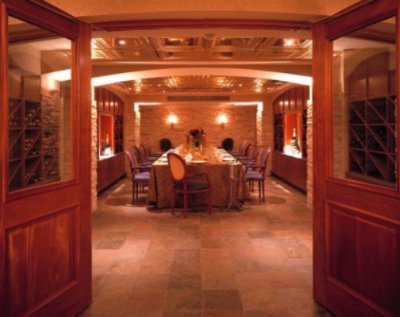 The Wine Cellar offers a more intimate area for small dinners or parties. The private dining room comfortably accommodates up to twenty seated guests. Slate floors, natural stone and wood create an elegant setting highlighted with the warmth of gold pressed-tin ceilings and dimmed lighting. An extensive selection of wine and champagne further enhance the dining experience. 28 x 15 x 8 Ft.